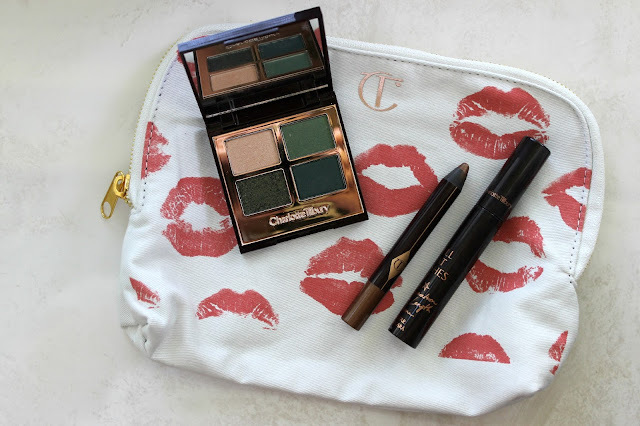 I'm here with part two of my Charlotte Tilbury review posts, and today, I'm talking all about eyes. Like I said in my last post, I was sent a goodie bag of treats. Because of this, I got some colours outside of my comfort zone, but I've loved experimenting with things that I wouldn't otherwise have purchased. Take for example, the Luxury Palette in The Rebel. I was never a fan of green eyeshadow with my pale blue eyes. There was something about it that always looked off. But I have gained an appreciation for teal colours more recently. The Lancome French Innocence palette was my cause of this newfound love affair, but the bottom right colour in this quad is equally as beautiful. True to it's rebellious name, I've been wearing this palette differently: I apply the top left colour all over the eyes, with sometime like Mac's Wedge in the crease, and the bottom right shadow on my lower lash line. It gives a really interesting effect, and has a beautiful summertime smokey look to it. 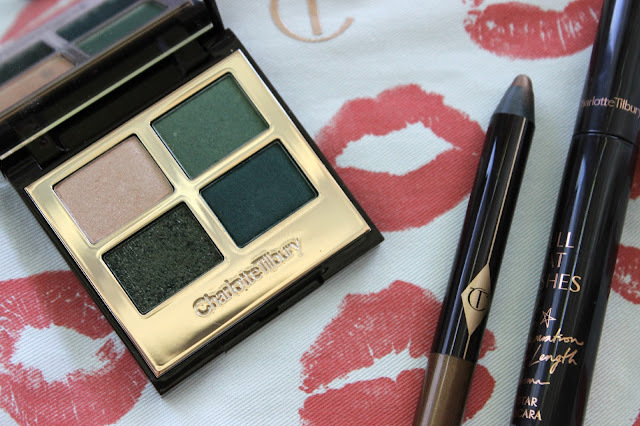 Now, I'm going to concede to something that I very rarely do: I actually prefer a drugstore version of this shadow stick to the Charlotte Tilbury one. I know, gasp. But the Colour Chameleon in Amber Haze is quite hard to blend. It has chunkier glitter bits in it, and because of that, it doesn't disperse evenly. And while the colour is absolutely gorgeous, I don't find the longevity great. It will last maybe 4 hours on my oily lids without primer, before it starts creasing and rubbing off in places. If you want the convenience of a shadow stick, I'd definitely recommend the Rimmel Scandaleyes option instead. Not shown above (because I finally bought a new makeup table, and it got misplaced in the reorganization) is the Feline Flick in Panther. It's a black liquid liner with a very fine felt-tip nib. It sets relatively matte, and is super easy to use with the comfy handle, even for a liquid liner noob like myself. It even seems to swatch a bit more intensely black than my Kat Von D liner in Trooper. My only complaint is the packaging. Unlike the Kat Von D packaging, which has a very bouncy, satisfying click closure, this cap seems to barely stay on. While the product is great, I'm not sure how long it will last before the ink starts to dry up. And lastly, because I like to finish on a high note, is the Full Fat Lashes Mascara in Glossy Black. 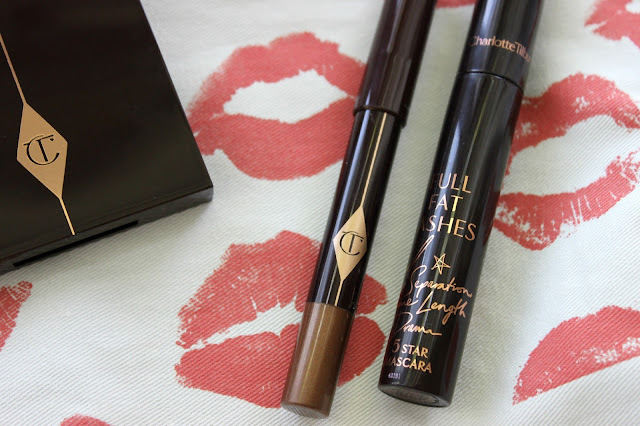 I always say that I would much rather use drugstore mascaras, because they are just as good. But with this mascara, I stand corrected. It is an absolutely amazing product. It's a very intense black colour. It does an amazing job at curling, lifting, volumizing, and lengthening lashes. It literally does everything. I think if you are near a Charlotte Tilbury counter, and you can afford the heftier price tag, I would highly recommend this mascara. What are your favourite Charlotte Tilbury eye makeup items? I'd love to hear your recommendations!